Oral and Maxillofacial Surgery-These are surgeons of the mouth and face. Mostly they remove wisdom teeth, but do many other things as well. They remove tumors and biopsy lesions. They often do cosmetic reconstruction of the face after trauma like a car accident or for orthodontic cases. This is the fairly glamorous and dramatic kinds of things you see on TV shows. Some of what they do overlaps with plastic surgery and /or other surgeons. They often have an M.D. degree as well as a dental degree. Usually this specialty takes 5 additional years of school and experience after dental school. Most Oral Surgeons I know are "Get-R-Done" kind of folks. They like closure and are typical confident surgeons. One more thing, a doctor with a DDS does not mean he is an oral surgeon. Se my post on DMD or DDS, What's the Difference? to explain that. Orthodontics-This is the most common specialty with which most people are most familiar. You know, Braces. Most of their time is spent placing and adjusting braces that correct crowding and other defects of the occlusion and face. They even get involved with the orthodontic side of surgical cases. They coordinate with the oral surgeon on these types of cases. Diagnosis is an important part of this specialty, the understanding of growth and development. Most Orthodontists I know are compulsive perfectionists. Pediatric Dentistry-This is my baby. Just like with Pediatrics, Pediatric Dentistry is an age-defined specialty, not a procedure defined one. We see children form birth to 21 years of age. That usually gets the kids through the time when dental growth ceases and they get their wisdom teeth in (or out). I still have some older patients that don't want to leave when they get older! 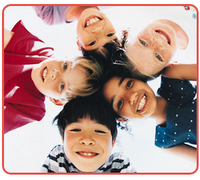 We do comprehensive treatment of children. That means preventive and restorative treatment. Much of the skills inherent to "Pedo" have to do with behavior management and getting the treatment the children need in the most comfortable and fun way possible. Pediatric Dentists also do braces. You have to be a special type of person to be a Pediatric Dentist. Some of us are goofy and outgoing, some are quiet and gentle, but all of us love children. Many people wonder how we can do it, dealing with children all day long under stressful circumstances. 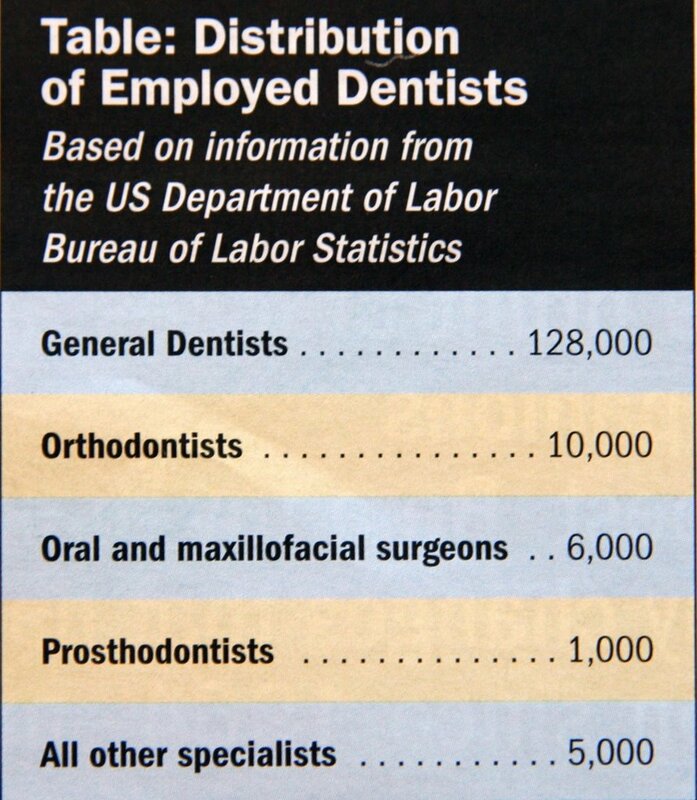 Even other dentists who are skilled at many other things will never get near a child patient. The secret is that the parents often are much harder to deal with than the kids! Endodontics-This is the specialty of the pulp of the tooth. Root Canals mostly. It takes patience to do this. Cleaning out the canal of the tooth and filling it up. They are really nice people. Periodontists-Gum doctors. They usually do periodontal surgery of the gingiva. Some also do implants. Where the oral surgeon can do magnificent surgical things, the periodontist is more of a finesse surgeon. They can place on of the most complicated sutures (stitches) I have ever seen. Prosthodontics-these doctors replace and repair teeth and oral structures. They do crowns, bridges, implants and especially Dentures. Every general dentist does these things too, but the Prosthodontist treats the more complicated cases. Oral Pathology-Whatever a surgeon removes, the oral pathologist tells you what it is. They work in a laboratory environment and almost never even see the patient. Their decisions and diagnosis, however, are extremely important. They can tell you if the lesion on your lip is benign or if it is cancer. They can also do the "CSI" thing with forensic dentistry. I used to love histology in school. This is the specialty of microscopes and laboratories. Oral Radiology-X-Rays. Oh the things you'll see. Superman never had the vision skills of these guys. Radiology along with the pathologist can determine what disease process you are dealing with. Magnetic Resonance Imaging (MRI), Digital Computer Enhanced Imaging, etc. are the realm of the radiologist. They are usually are at the dental school in some dark room somewhere. Public Health Dentistry-These are the unsung heroes of Dentistry. 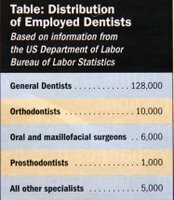 They may have done more for the dental health of the public than anyone. Their job is to prevent the problems the rest of us are spending all our time fixing. They also have to deal with insurance and access to care issues as well. They usually are in academic settings. All these specialties involve additional schooling beyond the four years of dental school (usually two or three years, or five for oral surgeons). Unlike with physicians, you usually have to pay tuition rather than receive a salary or stipend during these years. General dentists also can receive additional education like General Practice Residencies (GPR's are usually one year) and continuing education. All of us never really finish school, however. The science advances as fast as we learn/forget the old stuff. 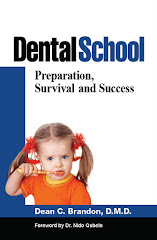 More info here too: How Do You Become a Pediatric Dentist or Orthodontist?